These tips are excerpts from 101 Bench Tips by Alan Revere, published by MJSA. Illustrations by Sean Kane. At work, deeply focused and concentrating on the activities of tools and materials, a goldsmith becomes part of the bench, moving smoothly and effortlessly from soldering to bending to drilling to filing to setting to forging. The artisan barely stops to search for a tool, each appearing at just the right moment from its nearby perch. The art of making jewelry is unique among the crafts in many ways. One is that jewelers use more tools than anyone else. Most experienced bench jewelers have dozens of files and hundreds of burs, saws, drills, and countless other small and important tools. With so many different tools to keep track of, goldsmiths must set up an efficient and functional workspace, where tools are logically arranged and easily accessible. Since most jewelry work is accomplished while seated at the bench, all of the tools should be arranged so that they are easy to see and reach, with the most commonly used tools nearest at hand. This illustration shows Alan Revere’s bench, with most of the important tools indicated. 1. Shelves for miscellaneous tools and supplies. 2. Elbow lamp with fluorescent and incandescent light. 4. Saw hangs on lamp. 5. Files in PVC tubes. 6. Soldering pad and charcoal block. 7. Pliers, shears, and tweezers on rack. 8. Spinning rack with burs has a well in the middle of it for other tools. 9. Can for needle files. 13. Bench pin on Bench-Mate system. 14. Hole to rest ring mandrel. 15. Bench. A wide range of materials and styles is available. 16. Benchtop is 38 inches off the ground, with a 10 inch radius cut out for goldsmith to sit close. 17. Pull-out drawer for gravers, engraving block, and sharpening stone. 18. Chuck key on retractable cord. 19. Pull-out catch pan for filings, tools, etc. 20. Foot pedal for flex-shaft. Most flat and square files-both large hand files and small needle files-have cutting surfaces on all four sides and on the edges. The sharp edges are great if you want to carve a 90' groove into a piece of metal, but they can be problematic for certain applications, such as finishing a bezel setting. If you want to clean up the top of a setting, a file with sharp cutting surfaces and edges all around will put the stone in danger. However, with a little effort, you can modify a file that will allow you to play it safe. First, prepare a safe surface on one side of a fine-cut (#4 or #6) square needle file. (Note: You can also use the following steps to modify -barrette needle files, which are great for finishing prongs.) To do this, carefully lay one side of the file against the spinning wheel of a bench grinder and draw it across, removing the abrasive cuts on that side of the file. Repeat until the cuts are completely removed. After rough grinding, take the file to an oiled sharpening stone-the kind you use to sharpen gravers, drill bits, blades, etc. Hold the file flat against the stone and rub it back and forth to smooth the new surface and remove marks left by grinding. When the surface is smooth, knock the cuts off the edges on both sides of the newly cleaned surface. With all remnants of the original cuts removed, use progressively finer grits of abrasive paper to bring the surface and adjacent edges to a polish. Begin with 220 grit paper held against a flat surface. Proceed to 320, 400, and 600-grit. Finish up with 4/0 polishing paper. The file should shine on one side. And with that, you have a file that is "safe" for finishing bezelsand prongs. Keeping in mind that all stones can be damaged by abrasion, place the safe surface very lightly against the stone andfile the setting to perfection. Like all tools, your hammer and vise have more potential than meets the eye. Let's say that you need a steel block on which to forge a small piece of metal. Not to worry: just grab a planishing hammer and mount it in a vise as shown above; you now have your flat anvil. When clamping steel tools, always use copper jaw liners on your vise. Also, be sure not to clamp down on the eye of the hammer, where the handle is mounted; it could snap the steel. Or let’s say you need two convex forms to press a ring shank onto, in order to make it belled at both ends. Just take two round-ended ball peen hammers, place one in the vise, and use the other to apply top force. (You could also use a punch and hammer as the top force.) The key idea here is, as always, to find the new uses hidden in your old tools. Another tool adaptation is to turn the tip of a needle file into a graver, so that it can both gouge and abrade. This can be done with any shape needle file (round, square, flat, etc.) Take a sharp fine-cut needle file and, with a sharpening stone, grind a facet at the end as you would on a graver. (I prefer to use a middle-grit India pre-soaked sharpening stone.) Once you have a flat face, sharpen it just as you would a graver, at an angle of about 55°. decreasing the pressure and lowering the handle, you can file with control and precision—and have the benefits of two tools in one. Jewelers frequently are required to saw two parallel lines in metal, such as when removing one size from a ring shank. In this case, it means making two perfectly parallel cuts 2.5 mm apart. At first it might seem to make no difference how the task is approached, so why not just saw through one place all the way, and then saw through the other? But as you start to make the second cut, the ring becomes surprisingly hard to stabilize. With the metal sliced all the way through from the first cut, the piece becomes flimsy, making it hard to hold onto for that second cut. Next time you ‘re faced with this problem, try alternating between the two cuts. Saw only halfway through he metal for the first cut, and 75 percent of the way for the second. Then return to the first cut and saw 90 percent of the way, and continue alternating in this manner until both cuts are 95 percent complete. The remaining bridges of metal stabilize the pieces, and you can cut through the remaining 5 percent on either side much more easily. You’ll be surprised at the difference this little trick makes, especially when cutting though thin metal. Ziploc bags can be found all over the jeweler’s shop: small parts come in them, gems are stored in them, and they work great for collecting everything from gold dust to solder chips. But here is a new use, one that will make you marvel again at the mind that figured out how to make a resealable, airtight bag for only a penny. Suppose you have to clean your customer’s old diamond ring—one worn so much that the diamonds are held in place only by dirt. The prongs appear worn down to the girdle, and you’re afraid that if you put it into an ultrasonic cleaner, half of the melee will wind up at the bottom of the tank. The solution? Grab a Ziploc bag, fill it with ultrasonic solution, seal it, and then float it in the ultrasonic tank as you flip the switch. If anything falls out, it stays in the bag. This procedure can also be used to hasten the effects of a solvent, too. For instance, if you just set a brooch and you don’t have 10 minutes to wait for the shellac to dissolve into a jar of alcohol, place the piece in a Ziploc filled with alcohol. Seal the bag and float it in the ultrasonic bath. The added ultrasonic waves will activate the solvent and clean the piece down to bare metal in a jiffy. Lubricate often: Use a lubricant to keep the drill bit cool and sharp. Almost anything can be used: motor oil, soap, kerosene, oil of wintergreen, machne oil, and even saliva. Newer lubricants, such as BurLife last longer than traditional lubricants because they do not evaporate. Use low speed, high feed. This maxim is the cornerstone of proper drilling. Rather than drilling at a high rpm, use a relatively low speed (just make sure it’s fast enough so the bit doesn’t grab) and press the drill into the metal. If you rev your flex-shaft like a hot rod, you’ll end up burning drill bits and decreasing accuracy. Drill straight. Drill bits, especially small ones, can break when not guided straight intto the metal. Rotate the work periodically so you can view it from different angles to ensure perpendicularity. Use graduated sizes. To achieve the most accuracy and make drilling easier, always start with a small pilot hole followed by progressively larger drill bits up to the desired size. Angle the drill bit to move a hole. One of the benefts of using graduated drill bits is tha tyou can correct your work. If a pilot hole wanders and winds up off the mark, you can move it while drillnig with the next, larger bit. Begin with the drill straight. Just after it enters, release the downward pressure and slowly tilt the bit slightly so that the tip is pointing in the desire direction. Continue to drill as the bit enters at an angle, and then slowly bring it back to the vertical position. Complete the hole, which has moved slightly in the desired direction. To make a ring larger, normally you just add a piece of metal or stretch the ring. But what if you need to go up half a size on a heavy gent's wedding band, and you don't want to add more metal? Or maybe you're sizing band with an outside pattern that you don't want to ruin, which either of the above options would do. If you have a ring stretcher, this would be the perfect time to use it. If not, and you need to coax the ring up the mandrel a little bit,there's another way: Use a file as a hammer! Prepare an old, large, heavy flat file by grinding the teeth off of the edge; bring it up to about a 240-grit finish. Now place the ring on the mandrel and brace the mandrel firmly. Place the file/hammer on the large flat surface on the mandrel, with the finished edge against the ring. Now slide the file/hammer up to the small end of the mandrel and with a bit of force, quickly back down against the ring, forcing it up the mandrel. It is amazing how much force this can carry and how effectively you can move metal. When finished, you need only to touch up and resurface the edge of your enlarged ring. Riveting is frequently used at the bench to join parts, create moveable components or to cold-join heat-sensitive items. If you want to rivet two pieces of metal together in a fixed position, clamp the pieces together and drill a 1 mm hole through them. Separate the pieces and remove the burrs around the holes. Now draw a piece of wire to fit the holes' diameter as tightly as possible, with no play or wobble. Trim the wire to about 1 mm greater than the thickness of the materials to be joined, and file the ends flat. Line up the parts and insert the pin into the aligned holes, centering it so that 0.5 mm protrudes from each end. Support the bottom of the pin on a steel plate, then use the thin fin of a cross peen (such as a goldsmithing hammer) to gently tap the top of the pin, spreading it slightly. This is called "upsetting" a rivet. Be sure that the pin remains centered between the materials, while using the hammer in one direction so that the metal stretches and the cross section of the end becomes elliptical. Flip the work over and repeat the process to begin to upset the other end of the pin. Now turn the work 90 degrees and strike across the previous marks, spreading the metal in the other direction so that the head of the upset rivet returns to round. By now the metal has flared and the parts are locked together. Tighten carefully as needed by hammering. Avoid slipping which would mar the surfaces. To create a dome head, finish with a polished concave-ended punch, like a beading tool. Every tool that rubs against metal leaves a mark corresponding to the tool's finish. That means some tools, such as gravers, need to be maintained with an ultra high polish. When sharpening a graver, you generally polish the belly, since it is the underside that leaves the finish on the metal. To do this, hold the graver flat and rub the belly firmly against a series of progressively finer grades of abrasive paper; the paper should rest on a very flat surface, such as a piece of glass. If the tool is new and needs a lot of work, begin with 220 grit, then proceed to 400 and 600 grit. Next, lap the surface on 4/0 polishing paper, which is extremely fine and leaves a polished surface. However, if you want to achieve the absolute highest luster, here's a trick. After the final polish, take a regular graphite pencil and charge up a section of the same 4/0 paper, until the area is covered with graphite (a lubricant). Now re-polish on this section, applying strong pressure. You can then take out your work, use the graver and note the smile you see in the brilliant reflection! Goldsmiths often use mallets to form and smooth metal, in a process called "bouging" (rhymes with "rouge-ing"). These days, bench jewelers can choose mallets of many different materials, such as rawhide, rubber, and plastic. But long ago, the best mallets were made of horn. Horn mallets seem to exert more impact and leave fewer surface blemishes than rawhide. And because horn has an interior grain, the working surface holds up for a long time, after which it can be reshaped for even further use. Unfortunately, horn mallets are not commonly found in jewelry tool catalogs, at least not in the U.S.
Fortunately, they are fairly simple to make. The first thing you need is a cow horn or an antler. (Try finding them in a Western supply store.) Using a probe, determine where the hollow interior ends, then use a saw to cut the horn off in the solid area just beyond it. Drill a 3 mm hole from the inside to the outside of the curved horn, midway between the ends. Repeat the drilling with 6 mm bits. Now take a standard hammer handle and carve and re-shape it to fit the hole tightly. Once the fit is tight, drill a 2 mm cross hole through the horn and the handle, then force in a 2 mm brass rod. Cut and upset (flare) the ends with a hammer. Now file the business end of the mallet to a smooth, slightly convex surface, and you're off and bouging. Because of their size and shape, some jewelry tools pose unique challenges. Small punches, for instance, can cause fatigue if held in one hand for too long. And once you've put it down, there's no guarantee it won't roll away. So try putting a cork on it! Find a used wine cork (you probably know someone with a few lying around) and, drill from both ends, create a hole straight through its center. The hold should be slightly smaller than the diameter of the punch–for a 4 mm shaft, drill a hole that's about 3.5 mm. Now slide the cork onto the shaft and use a rasp, a coarse file, or very coarse abrasive paper to create one flat side on the outside of the cylindrical cork. Now you have the most comfortable, most grip-able, and most controllable punch possible. And it will never roll off your bench. The problem: You need a piece of half-round gold wire for a ring shank—and you need it right away. You don’t have any on-hand, and there is no time to place an order. All you have is round wire that is larger than what you need for the shank, and a round draw plate. The solution: Take the round gold wire (it must be larger than the half-round wire you desire) and fold it in half, tapping the bend tight with a hammer. Taper the bent end in preparation for inserting it into a draw plate. You can do this by step rolling in a mill, by forging out the end with a hammer, or by filing to a taper. If the ends separate, solder them together and continue to taper them. Aneal and then draw the two wires down through the graduated holes of a round draw plate. The round wires are pressed together, forming a flat boundary between them. The result: A half-round wire for the ring shank. You can also make 1/3 or 1/4 round wire by starting with three or four pieces of round wire, respectively, and following the technique described above. Need a professional-looking gold stopper for a stickpin? Here’s how tomake one easily. Anneal a piece of thin-walled 14k or 18k yellow tubing that is about 10 to 12 mm long and 3.5 mm in diameter. File the ends flat, then chuck the tube about halfway into a flex-shaft. Using a stationary ball bur or bud burmounted in a pin vise, thin one end from the inside by pressing the bur into the tubing as it turns. Now hold a file against it and, as you turn the tube again, thin the metal to a knife-edge. Remove the tube, turn it around so that the other end sticks out of the flex-shaft, and repeat. 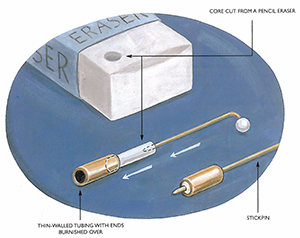 Use a piece of wood to press the sharpened tube into a pencil eraser; one or two tries will be all it takes to cut a perfectly cylindrical core. You've probably noticed an attractive pattern that looks like overlapping swirls on some machined metal surfaces. This is the result of end milling, through which a series of circles can cover a surface evenly and uniformly. While jewelers may not be able to replicate the machine precision of professional milling, alluring optical surfaces can be created pretty easily at the bench. Here's how to create one that looks great on recessed or protected surfaces, such as the inside a box or the back of a brooch. Put a cylindrical rubberized abrasive wheel in your flex-shaft and flatten the front with a file as it turns. To increase the effect of the pattern, dip the working end of the wheel into an abrasive paste—pumice mud, household detergent, or even toothpaste. Now place the wheel perpendicular to the surface of the metal, turn on the motor, and press gently; the wheel will leave a very perfect set of concentric circles. Make a second impression in the same way, covering 1/4 or so of the prior circle. Continue moving this way along a straight line, then start a second and third row, until the area fills completely. If the impressions are even and spaced regularly, the effect is tantalizing and beautiful. But remember, as lovely as this texture is, it is also superficial and very sensitive to wear and abrasion. Jewelry work requires great patience, in addition to an unyielding commitment to precision. Think of precision and patience as your partners, helping you to stay focused on achieving your goal of excellence, no matter how long it takes. Building jewelry should not be a race against time, but a journey toward quality: In the long run, your work will be judged not by how fast you completed it, but by how well you completed it. And this requires a dedication to doing your best at every step, so that you do not have to waste time reworking or undoing needless mistakes. So slow down, check your work right from the start and all along the way, and remember: What is most important is that every piece you make represents your very best effort. This series of tips is from Alan Revere's continuing column in MJSA Journal, and will be collected into a book. Illustration by Sean Kane. Because nearly every soldering operation presents new problems to be solved, there are many specialized soldering techniques that are not widely discussed. The problem nearly always boils down to the same issue: how to heat a piece of jewelry evenly, so that the parts being joined reach the solder temperature at the same time. Often if there is a large flat piece and a small upright piece to be joined, it is difficult to bring them to the solder temperature at the same time, because of their different masses and positions. Heating the larger lower item can be much more difficult than heating the smaller upright component. One trick is to pre-heat a portion of your charcoal block. This is one of the reasons to choose charcoal, which absorbs heat, over a refractory soldering surface that reflects heat. Once the charcoal is glowing over a broad area, slide the work over it and it will be heated from below as well as with your torch from above. The net result is like having two torches, one from above and the other from below, insuring a very even heating cycle. Anytime you rub a steel tool against a gemstone, you risk scratching the stone. Whether it is a file or a burnisher or a cup bur, if the surface of the tool is rough, the risk of damage is high. Unfortunately most factory tools are not finished sufficiently and require some fine-tuning at your bench before putting them to use. Just as finishing files are prepared with a polished safe edge for working around stones, and burnishers are always polished to impart a polish, so should cup burs be finished, to avoid damaging stones. Every time you use a new cup bur, take a moment to polish the end first. Place the bur in the hand piece of your flexible shaft machine and hold the flat end against some 4/0 polishing paper. Spin the bur and polish the end, avoiding contact with the interior cuts of the bur. Now when you use this bur to work around prongs, even if the it accidentally touches the stone, there is far less risk of scratching it. Here is a tip that will make you scratch your head and ask, Why didn’t I ever try this before? During many jewelry operations, after filing, burring, setting, and even bend-ing, you are left with a rough or sharp edge on the metal. You can sand or file down the edge, but it’s not always easy if the area is difficult to reach. A great solution to this problem is using the back of a barrette needle file as a burnisher. Let’s say you are finishing a setting job. No matter what type of setting it is, there is always a sharp corner or edge left by your work. You should remove this sharp corner because it is not only unattractive, but also dangerous for the wearer, who can catch it on clothing or flesh. Grab a fine cut (#6 or #4) barrette needle file. You might want to prepare the back, which comes without teeth, by sanding and polishing it. At the end, use this file for the final cleanup, then flip it over and use the polished corner to rub against sharp corners and edges in your work. This beats polishing because it is more specifi-cally directed, it does not remove metal, and it leaves a high luster. I always use this technique as the final touchup after finishing prongs and bezels. One of the most difficult aspects of soldering is often just holding the pieces in place long enough to heat them. Added to that, when the solder flows, it can lubricate the contact area so that the top piece can literally swim around uncontrollably. The key here is to find some way to hold the pieces in place. Binding wire is always a possibility, but it can be cumbersome and time consuming to apply. Clips and clamps might work, but here is a simple way to use a tool you already have, for a slightly unintended purpose. Most jewelers already have a "third hand," on their bench. These are soldering tweezers mounted on a stand, intended to hold an assembly in the air for soldering. But like most tools, it you look hard, there are other (often unintended) uses. The next time you need to hold something down, use the third hand as a weight. Do this by adjusting the angle of the tweezers in relation to the base, so that the tip of the tweezers is over-bent, so that the front of the base of the third hand is partially lifted off the bench top. The angle can be adjusted to add weight. This technique is perfect for holding any slippery little bits of metal in place for soldering. Essential bench tools, sanding sticks are used for finishing metal surfaces throughout the jewelry making process. Although some suppliers offer them, most bench jewelers make their own. Sanding sticks are used progressively from coarse to fine in preparation for buffing and polishing metal, and they are virtually indispensable for jewelry work. To make one, take a paint mixing stick from your local paint or hardware store and place it on the back of a piece of abrasive paper. Line up the edges and then use a scribe to score a crease in the paper. Carefully roll the stick a quarter turn and make the second crease, third, and fourth. Wrap the paper tightly around the stick and continue to score and roll the paper until it is wrapped completely and tightly around the stick. Use a stapler to affix the paper at multiple points on the overlapping edge and rip off the excess. For easy identification, mark two, four, or six dots on the edge of the stick to indicate the grit: 220, 400, or 600, respectively. You now have a renewable sanding stick ready to jump into action for precision finishing. It used to be fairly common for bench jewelers to keep a loaded pistol nearby, sometimes actually mounted under the bench top. You can honor that tradition today in a much safer way: Rather than using a gun for protection, use one to keep things cool. If you are a serious bench jeweler, try keeping a loaded water pistol nearby. When soldering, you often need to protect delicate gemstones, enamels, and other heat-sensitive materials from getting overheated and damaged. One way to do this is to submerge the sensitive part in water or wet sand while soldering an area that is exposed. But if you are quick with the torch, you can just shoot your way out of an overheating problem with a water gun. As soon as you have finished soldering, immediately pick up your plastic special and squirt the hot part to drain the heat out. If you?re a sharp shooter, you?ll hit the mark and protect the heat-sensitive area, while keeping the rest of your bench dry. If you've ever worked on a hollow piece of jewelry, you know that if liquid - especially dilute acid - gets trapped inside, it can cause problems later. After soldering a post onto an earring, a jeweler usually puts the piece into a dilute acid solution or "pickle" to dissolve the flux and remove oxidation. Rinsing removes all of the acid easily. But when acid gets trapped inside a hollow form, even if it dries, it will continue to affect the metal, slowly leaking out of the hole and potentially irritating the wearer. Here's the bright idea to prevent this problem: Shake as much of the pickle solution as possible out of the hollow area and then place the piece on a light bulb. The heat will warm the solution and it will evaporate within minutes. Once dry, put the piece under warm water and fill up the cavity again, thus diluting any residual acid. Shake out the liquid and dry it on the light bulb. Repeating this process two or three times will ensure that no acid residue remains. Anyone who has ever soldered jewelry, has a searing memory of sacrificing a flux brush in the name of expedient soldering. This occurs when, in the middle of an extended soldering operation, you observe that although the metal is hot enough, the flux is not sufficient for the solder to flow. Perhaps there was never enough or it burned off during extended heating (which should be avoided). So you put your flux-wet brush on the hot metal to add more of the vital liquid, which of course sears and ruins a few bristles on the brush. That's okay if your family owns a flux brush business or if you use the cheap kind. But I use a #00 Red Sable (artist's type) as a flux brush, and I want them to last. Remember all those saw blades you broke when you started out. Did you save them? Now at last here is a use for your blade bits and pieces, at least the ends. When my friend John Cogswell showed me this trick, I was amazed! I had heard of using saws as files, gravers as punches and files as gravers. But who thought to use a saw blade to drill a hole. It works! Take a pair of pliers and snap off about 15-20 mm from the top of a blade, where there are no teeth. Any size works and the size of the blade dictates the diameter of the hole. Use a grinder, sharpening stone, diamond file, or even flat carborundum paper to put a crisp 45-degree facet at the top, leaving a flat blade-like edge. Insert the blade into a flex shaft with an adjustable collet. This blade will now drill into anything softer; wood, plastic, bone and even jewelry metals. Although there is no point, the flat blade, when brought firmly in contact with a metal surface, will begin to shear metal away, creating an indentation. Add pressure as you guide the saw blade through the metal leaving a crisp hole. If necessary, pause and re-sharpen the blade, depending on the thickness and hardness of the material you are piercing. Ever wonder how your charcoal block came to be? Charcoal is made by heating wood in a reducing atmosphere in which there is not enough oxygen for combustion. The process, which is called pyrolysis, results in a black, soft, brittle, lightweight, porous material, which is ideal for our purposes at the bench. Many of us use charcoal blocks daily to support our work for heating. The charcoal captures the heat and creates an oven-like reducing atmosphere that's perfect for soldering and annealing. Once in a while the heating process takes a long time, such as when annealing a large piece of metal. During these prolonged heating operations, the charcoal will continue to smolder and decompose as the heat consumes the material, shortening the lifespan of the soldering block. In these situations, it's a good idea to quench your soldering block after use. If the block is glowing and likely to continue smoldering for a minutes, just dunk it in water. Safely grab it in a cold area and plunge the hot block under the tap or in to a bowl. (You can test for safety by sprinkling a few drops of water where you want to grab the block. If it doesn't sizzle, it's cool enough to pick up with our bare hand.) This arrests the combustion and saves the block for use another day. Once in a while the bezel you intended to hold a stone no longer fits. Somehow along the way, the stone either grew larger or the bezel mysteriously shrunk. Okay, there is also the chance that you miscalculated. At any rate, getting inside to trim or clean up a bezel takes the right tool. Often a file won’t work and most cylinder burrs in are too thin and tend to leave vertical lines, even if moved smoothly along the inside of a bezel. In this case there are a few simple modifications you can make to two basic burrs, so that they adapt to this specialized task. Remove part of the bur and alter the shape by carefully holding it up to a bench grinder. Start with an old large setting bur. These burs usually wear out on the tapered conical end of the bur. Grinding this part off will reshape the bur into a large cylinder burr, perfect for opening the inside of bezels, carving the inside of holes, etc. Alternately, take a large round burr and grind off the end to yield a half-round bur. This is ideal for making very fine adjustments at the base on the inside of bezels. Use the largest diameter bur possible for the cleanest and smoothest seat. Sometimes things get lost in the ultrasonic; a small item drops out of the basket or a stone falls out of its setting, etc. It is difficult to fish it out because it the piece is too small to grab with tweezers and the solution is too hot to put your hand into. Try using a paint brush to sweep along the floor until you feel it and then sweep it up the sides until you can grab it. By the way, NEVER put your hand into an ultrasonic that is vibrating. It damages your nerves!!! When you first get a new piece of sheet solder, color code it. Use Sharpie® permanent marking pens to completely cover both sides: red for hard, black for medium and blue for easy. Then when you cut snippets you can easily locate them if they drop into your tray as well as identify their melting temperature. The ink disappears without a trace when heated during soldering. Do this on all your solders; color coding wire solder and even tubes of paste solder. Occasionally a diamond falls on the floor and you cannot find it. In that case, turn off the lights and use a flashlight to spot it. * Always double it over and twist it for added strength and elasticity. * Make a nest of it to raise work off of the solder pad for more uniform heating. * Make a tripod of binding wire with three legs, to allow torch access from below. * Tighten binding wire with a two step process to avoid breaking it: After grabbing a few millimeters away from the work, pull the wire gently out, then as you relax the pressure, twist to tighten. Repeat as needed. If you have a piece with loose stones, put the piece in a ziplock bag before you put it in the ultrasonic. The vibration may shake the stone loose, but it will be easy to find in the ziplock bag. Part of the impact your jewelry making has on the planet is daily operations in your studio. However, an even larger impact starts with the daily operations of your suppliers. Do you know where the metal you use in your studio comes from? Do you purchase recycled metal? How can you find out? The best way to find out where the metal you are purchasing comes from is to call your suppliers and ask. Tell them that you want to purchase 100% recycled or sustainably/responsibly sourced metal and gemstones. While you are at it, tell them you want them to reduce their packaging and switch to recycled or returnable packing materials. More and more suppliers are making the shift to recycled metals because their customers demand it. All metal purchased from Hoover & Strong is 100% recycled. All sterling casting grain and sterling jewelry products cast in house at Rio Grande are 100% recycled. However, not all Rio Grande mill products are made from recycled metal. The next time you call your suppliers to place an order, ask about the products before you purchase. Where do they come from? Is the metal recycled? Are the gemstones responsibly sourced and processed without using child labor or under sweatshop conditions? What have they done to lessen the environmental impact of their packing materials? Ask them to see copies of their fair-trade, social and environmental policies. Then ask them which products are made in a manner that supports these policies. If no such policies exist, encourage them to develop responsible practices and follow them in all their sourcing. If a supplier can’t back up its practices, consider switching to one that can. In order to make jewelry in a responsible way, each of us must take extra care to be sure the materials we purchase reflect ethical values. Many jewelers use Bur Life® or Stay Sharp®, a non-toxic, odorless lubricant for burs and saw blades, available from Otto Frei. These push-up style cakes of lubricant become difficult to handle when the lubricant is almost gone, which might cause some jewelers to toss them before they have made full use of the package contents. Instead of throwing out the unused portions, save them! When you have several, microwave one container for just a few seconds, until the lubricant becomes clear and liquid. Be careful not to touch the hot liquid as you pour it into another container that you have saved. Continue to do this with all of your “almost empties” and let the full container cool. Voila! You have a container of recycled lubricant that is just as good as new!